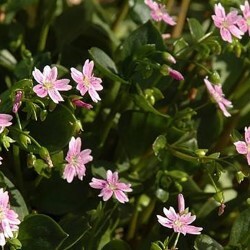 Claytonia There is 1 product. Fleshy rosette tuft of evergreen olive green leaves. Many small white flowers marked with pink lines to the very long flowering. Charming little plant that can colonize the cool areas of the garden. Use as planter.